Each morning, Katie Pehrson checks her smartphone, puts on her smartwatch and starts her day. As she shuts the door behind her, her thermostat adjusts to save energy while she’s gone. She leaves home with the peace of mind provided by her smart security system and smart smoke detector, both of which notify her smartphone if any problems arise while she is at work. Smart, right? Pehrson is immersed in the “Internet of things.” The world is increasingly connecting through devices and according to a 2016 IHS report, there will be as many as 30.7 billion connected devices in 2020 – more than four times the earth’s population. The Internet of things goes far beyond personal gadgets. The majority of smart devices are used in business such as in factories and healthcare, according to Intel Corp.
Interactions with these devices aren’t as obvious as people’s everyday use of smartphones, but they have immense impact such as controlling the power grid that provides electricity to homes and businesses. Companies striving for efficiency have created ways to remotely control legacy devices that were designed only for hands-on control. 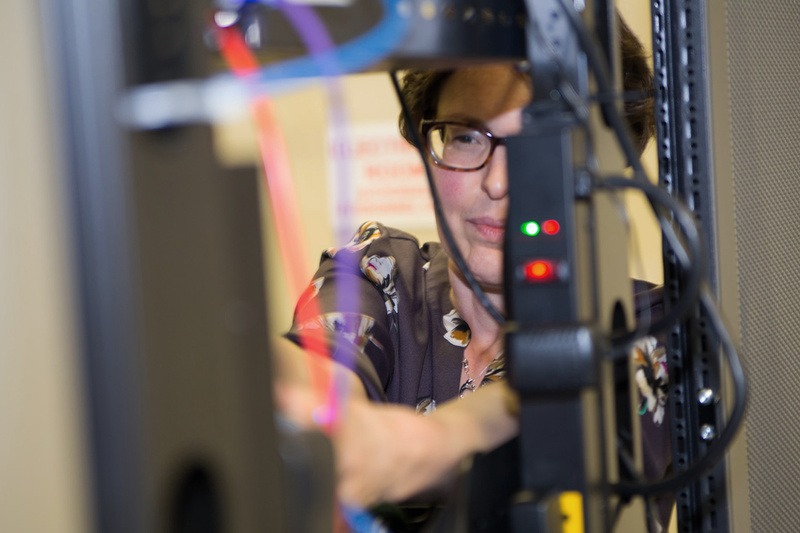 Each morning, when Pehrson leaves behind her world of personal gadgets, she heads to Bechtel’s Industrial Control Systems Cyber Security Laboratory where she works with the Internet of things on a much larger scale. Pehrson, the lab’s technical director, manages a team that protects critical infrastructure from cyber attacks. Critical infrastructure comprises the giant systems that support modern life, from power plants and water treatment plants to mass-transit systems. These facilities are operated through industrial control systems, sensors and components that talk to each other and to facility operators. These systems, like a smartphone, provides easy access to information and controls that would otherwise be difficult to get. The simple fact that an industrial control system can be accessed via the internet opens the door to malicious interference. Someone could fool the system into to reporting everything’s OK, even as a piece of machinery could be overheating or spinning out of control. More than a virus that damages data, these hacks can damage and destroy real, physical things. The cyber security team is working to keep those systems safe. “Providing information is a great thing, but we also need to understand how we can provide that in a safe way and in a secure way in industrial facilities,” Pehrson said. The cyber defense team at the lab must not only understand external threats, but also the infrastructure systems they are working to defend. Because of its experience designing and building those systems, Bechtel has unique on-the-ground insight. Beyond Bechtel’s experience in the construction process, the lab identifies vulnerabilities of the facilities it protects through tests on simulated and real-world equipment. In a world where technology is advancing quickly, keeping up with large-scale cyber security threats is a daily challenge. “We need to stay on top of technology to ensure that each new project we deploy is considering how to appropriately protect against the evolving threats,” Pehrson said. The lab stays ahead of threats through its innovative team, regular interaction with new technology, and by sharing ideas and information. In addition to the array of connected devices she comes home to, Pehrson walks in the door knowing she can turn on her faucet and flip on her light switch. This is possible because of the work the lab is doing to protect critical infrastructure. Find out more about Bechtel’s Industrial Control Systems Cyber Security Laboratory here.